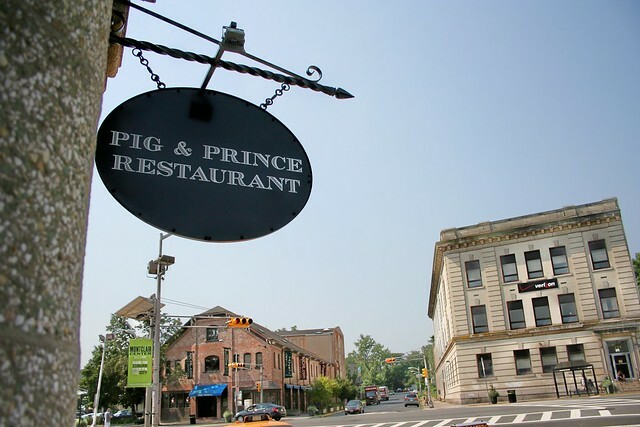 Pig and Prince opened in Lackawanna Station Montclair softly last week and from the reactions of customers everyone seems to agree that, despite being new, the place feels as if its been there all along. That feeling is a combination of the excellent restoration and renovation work led by Chef Mike Carrino as well as his incredible menu. Hot From The Kettle has been following the story of Pig and Prince from the moment the story first broke in January up to and including the opening. Of course in the future there will be many more visits to Pig and Prince by the Hotties but for now let's just take a look at how far along this story has come. Non-Foodie Tangent > Take note of how Mike Carrino explained his five year plan for Passionne and decided to close the doors when the date arrived. Setting goals and achieving them is great, but knowing when to move on to the next goals holds so many people back embracing their true calling. Summer is coming to a close, take some time this upcoming holiday weekend to reflect on those windows that need to be closed and think about the doors you need to open. In April 2012 Kettle broke the story about Mike's plans to convert the oft neglected yet architecturally sound waiting room in Lackawanna Station in Montclair into a new restaurant concept. That story on Hot From The Kettle ( Chef Mike Carrino Plans New Restaurant In Lackawanna RR Station) featured some of the history of the space including the story of the architect who perished on the Titanic. Locals who have already been to Pig and Prince might find the gallery of photos of interest as they show how the space was abused when it was home to Hollywood Video. (yes, those are purple walls). For the next several months Kettle kept a lid on the story (Kettle, lid, pun!) as work continued on the space. Carrino's participation in the 2013 Montclair and Wine Festival , of which Kettle is the founder meant the the two often ran into each other, the whole time keeping Montclair's best kept foodie secret just that - a great secret until last week's reveal to the public. For a while there even the name was hush hush. 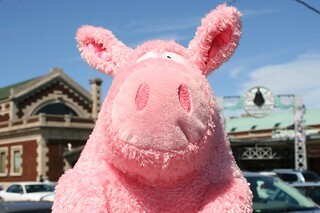 One of the Hot From The Kettle hotties even slipped this photo of Cameron at Lackawanna Station out there just to see if anyone noticed. They didn't. Fans of preservation and urban renewal will appreciate some of the details of the space. In the photoblog Pig And Prince : A Different Perspective On Dining In Montclair readers got the chance to see some of the details that make the restaurant so special. The foot rests along the bar are old rails from the Lackawanna Railroad, terrazzo tile floors that were hidden beneath the awful Hollywood Video carpeting are revealed, and restored lighting is shown in all its glory. While the formal review of the restaurant is set to appear in the coming weeks, Melody Kettle did share highlights of her first dinner on Pig & Prince : Items From The Menu this past weekend and from the look of things it seems that Carrino's goal for Pig & Prince being a place where the casual and elegant come together is happening perfectly.